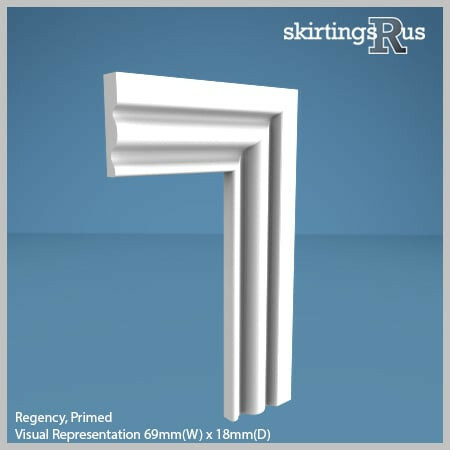 Regency architraves have a very soft, rounded profile, which has a very fluid appearance and creates an interesting feature to the eye by collecting shadow in the lee of its wave. -- Please Select --69mm/Ex 3" 96mm/Ex 4" 69mm/Ex 3" 96mm/Ex 4" 69mm/Ex 3" 96mm/Ex 4" 69mm/Ex 3" 96mm/Ex 4" 69mm/Ex 3" 96mm/Ex 4" 69mm/Ex 3" 96mm/Ex 4" 69mm/Ex 3" 96mm/Ex 4" 69mm/Ex 3" 96mm/Ex 4" 69mm/Ex 3" 96mm/Ex 4" 69mm/Ex 3" 96mm/Ex 4" 69mm/Ex 3" 96mm/Ex 4" 69mm/Ex 3" 96mm/Ex 4" 69mm/Ex 3" 96mm/Ex 4" 69mm/Ex 3" 96mm/Ex 4"
Our Regency architrave is made of a high density, moisture resistant (MR) MDF. MDF is free from natural defects. This gives it a long product life and means that MDF will not; warp, twist, bow, split, or contain knots, all of which you would find in pine and any other natural wood. This makes MDF the most economical, time saving material for your architrave requirements. Skirtings R Us MDF builds on these properties. We manufacturer on a high density MDF board which we have specifically sourced, as it produces a far smoother cut surface when moulded, superior to other standard or premium MDF architraves. For more information on our MDF please see our MDF information page. Regency MDF Architrave is available in a variety of set dimensions. We can also offer bespoke architrave widths at no extra cost. 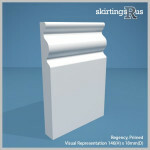 Width – Regency can be machined to 2 widths, 69mm and 96mm. Depth – Available in 15mm, 18mm and 25mm thickneses. lengths (unavailable in 15mm thickness). Single Door Sets - Consisting of 2 x 2400 and 1 x 1200 lengths. Double Door Sets - Consisting of 3 x 2400 lengths. Please allow 100mm on each end of the length for transit damage and cutting. 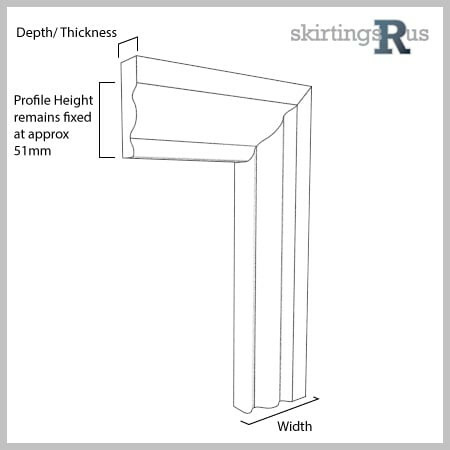 For more information on dimensions, see our architrave dimensions guide. Un-primed – Product will be supplied as raw MDF architrave, with no MDF primer applied. The product will need priming before any paint finish is applied. Please note: the product may need two or more coats of primer to fully seal it. Primed – Product will be sprayed with two coats of solvent based MDF primer and sanded in-between coats. The board will need a final paint finish. Any paint can be used to top coat this product including oil, water or solvent based paint. For more information, see the additional information tab (above) or our finishes guide to find out which finish is best for you. Cable space is not necessary on architrave. Pre-primed mouldings relieves a lot of work as MDF, being an absorbent material, can require two or more priming coats to seal it properly. If primed, mistakes and marks commonly made during installation can be rectified when finishing (unlike a gloss or satin finish, which is almost impossible to ‘touch up’ well and would be wasted). Therefore primed skirting boards/architrave is the easiest and most flexible product to install with less risk of permanently damaging the finish. We recommend a primed finish on skirting board and would urge anyone who is thinking otherwise to reconsider. For more information on primed finishes and the limitations of other finishes visit our finishes page. Our Regency MDF architrave is produced in house in our midlands based factory and is machined to order from the specification options above. If you can’t see what you’re looking for, then you should know we can cut to any size and undertake bespoke requests. For more information visit our bespoke page or feel free to give us a call! Please note: machined to order items are made specifically to order and therefore cannot be cancelled once in production, neither can they be returned to us. Specific delivery dates will be available to select from the delivery calendar, during the checkout process. This is a free complementary service, independent of all delivery costs. Orders will be despatched to our couriers the night before your selected date for delivery the following day. We strongly recommend you receive your goods before engaging labour. Delivery options are also available to select during the checkout process, with the exception of overnight and Saturday services. Please call to arrange these. Standard delivery is usually made three working days after placing your order* between 08.00 and 18.00. Delivery costs are calculated on weight. *During times of high demand and for large bulk orders lead times may be extended. Morning service drops are made between 08.00 and 13.00 (usually before 12.00, but an extra hour leeway is given). AM deliveries are charged at an additional £9.60. Please Note: We are unable to specify PM deliveries. Express deliveries are delivered next day between 08.00 and 18.00. Please call us before 11am the day before the materials are required. It is more likely we will be able to provide this service on un-primed skirting board orders. Express deliveries are charged at an additional £18.00. Please call if you require a Saturday delivery. Drops are made between 08.00 and 18.30 (usually before 13.30). Please try to order before Wednesday of the desired weekend. Saturday deliveries are charged at an additional £24.00. Will I get a phone call before delivery? We always instruct the courier to call half an hour before delivery, however we cannot guarantee this will happen. Can I have my order left without a signature if I can’t be in? Yes, but we will not be held responsible for any shortfalls or damage. Should you wish to arrange this, then please specify so on the notes box at the checkout, or by E-mail. We cannot accept this instruction verbally. Will the driver carry my order into my property? They may sometimes do so, but due to insurance restrictions, couriers are only responsible for kerbside delivery. Please make sure that you have adequate help to receive your order. What should I do when my order is delivered? Upon delivery, all packages must be opened and items inside checked for good condition and the correct number before signing for them. In the unlikely event of damage, sign the paperwork/docket machine as damaged. If you have any doubt as to the condition of the goods, you should sign for the delivery as damaged. As unexpected circumstances can on the rare occasion cause delivery issues, we strongly recommend that you do not book any tradesmen until your items have been delivered and checked. The amount charged for delivery is to cover the cost of handling and transporting orders only, it is not charged for organising a specific delivery date. For more info visit our deliveries page.